Hix N-880 Automatic Press - 16 x 20"
The HIX N-880 air-operated automatic heat press provides you with a number capabilities that you'll be able to depend on. With its efficiency, consistency, and rugged productivity, you'll have the ability to get the edge-to-edge coverage you require for those larger transfers. The HIX N-880 offers all the capabilities and performance you need in a clamshell press. Getting started with the N-880 is incredibly easy. Lowering the handle will trip a micro switch just before closure, and the machine will take over applying your preset pressure. At the end of the preset time, the machine will open automatically for you. This press helps reduce operator fatigue in long production runs. The N-880 is built with a long-lasting pneumatic air cylinder lift system, a larger air valve for faster clamping, and bushings in key areas for durability. This all makes this machine more suitable for extra high volume work. The HIX N-880 is also very useful in heavy traffic tourist retail shops where numerous garment types, such as sweats and T-shirts, are continuously being produced. Because it is air-operated, you can set the amount of pressure on the machine and it will adjust automatically to the product - no matter what the thickness. The N-880 features a touch-screen controller with a built-in digital timer that is adjustable up to 99 minutes, 59 seconds. It also shows the time countdown on readout, beeps after elapsed time, and resets when the handle is raised. The calibrated digital temperature control is adjustable up to 232°C and displays the current temperature. You can easily set the air pressure with the knob and see the PSI reading on the gauge. With the pre-press release, you can start pressing your garment to remove its wrinkles and then push the pre-press button to open the machine, all without having to wait for the end of the cycle for the press to open. 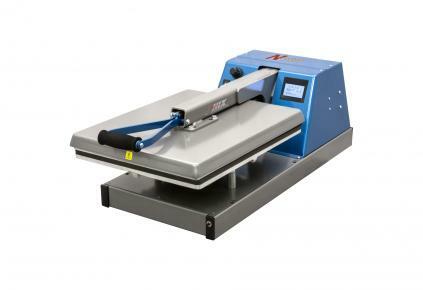 The N-880 is a commercial grade air-operated machine with a 16" x 20" (surface area) heat platen. It is built with a long-lasting pneumatic air cylinder lift system, a stronger air valve for faster clamping, and bushings at hinge points for maximum durability. This all makes this machine more suitable for extra high volume work.